Diets formulated with excess phosphorus can lead to an increase in phosphorus excretion, negatively impacting the environment. In addition, this mineral is the third most expensive component in swine diets after energy and protein. Phosphorus is an inorganic element that is essential for growth performance and development and maintenance of the skeletal system. Besides bone mineralization, phosphorus is involved in different biological functions such as energy metabolism, synthesis of nucleic acids and structure of cell membranes. However, diets formulated with excess phosphorus can lead to an increase in phosphorus excretion, negatively impacting the environment. In addition, this mineral is the third most expensive component in swine diets after energy and protein. Thus, diets are typically formulated to avoid its excess, with low margins of safety. Establishing the optimum amount of phosphorus to supplement into swine diets remains an important issue. The 2012 National Research Council adopted the concept of standardized total tract digestibility to report the requirements for phosphorus based on a modeling approach that is different than previous requirement estimates. There is a need for data to validate the model-derived digestible phosphorus requirement. Surprisingly, there are few studies under modern commercial conditions that have evaluated the phosphorus requirement. Therefore, we conducted this study to determine the STTD phosphorus requirement of nursery pigs from 25 to 55 pounds housed under commercial conditions. In this experiment, 1,080 mixed gender pigs initially 25.1 pounds were assigned to one of seven dietary treatments in a 21-day growth study. Treatments consisted of 0.26, 0.30, 0.33, 0.38, 0.43, 0.48 and 0.53% STTD phosphorus, which represented 80, 90, 100, 115, 130, 145 and 160% of the NRC (2012) estimates, respectively. The STTD phosphorus levels were achieved by increasing the inclusion of limestone and monocalcium phosphate at the expense of corn. A constant 1:17 calcium-to-phosphorus ratio was maintained across treatments, with no phytase added to the diets. 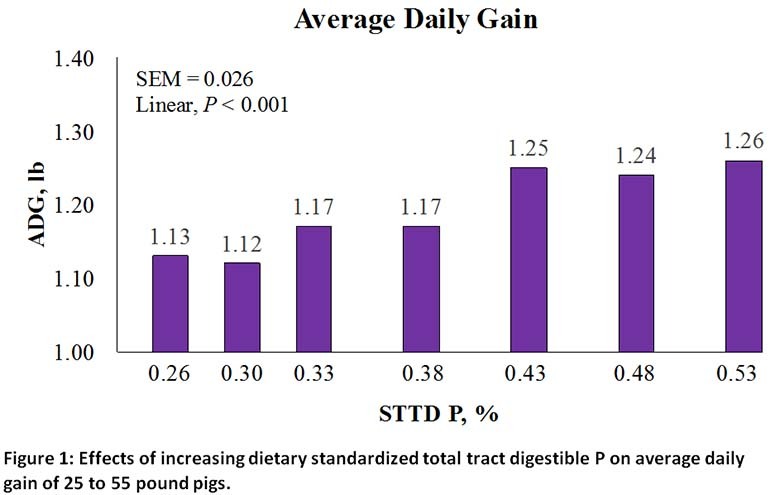 Increasing dietary STTD phosphorus linearly increased average daily gain through the highest level fed (0.53% STTD; Figure 1). 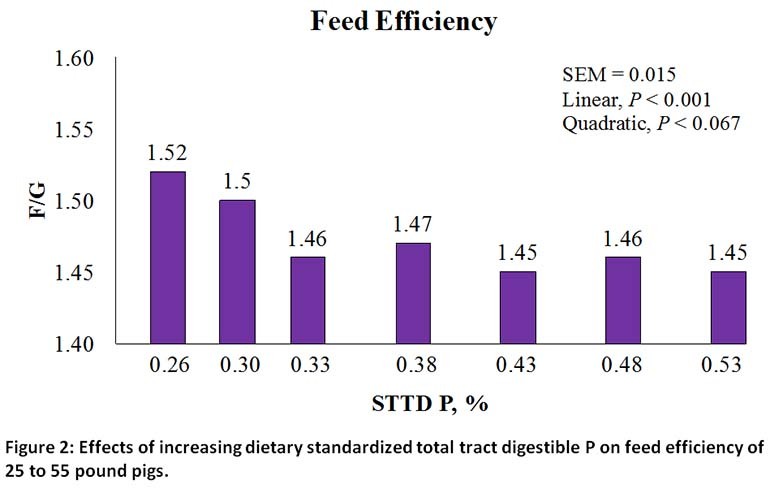 The best feed efficiency was observed when pigs were fed between 0.34% and 0.43% STTD phosphorus (Figure 2). The range for best feed efficiency also resulted in the best feed cost per pound of gain for pigs fed between 100 and 130% of the current NRC (2012) requirement. 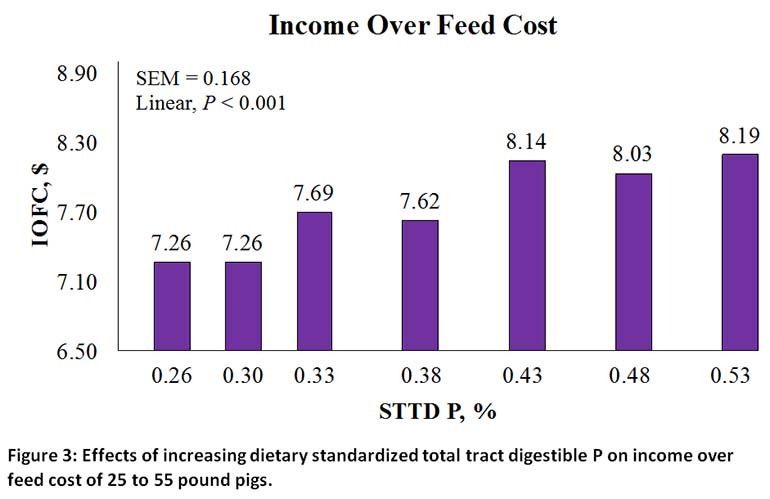 Income over feed cost was highest for pigs fed 0.53% STTD phosphorus (Figure 3). In summary, the estimated STTD phosphorus requirement for nursery pigs from 25 to 55 pounds ranged from 0.34% to at least 0.53% depending on the response criteria. These data indicate that the 0.33% STTD phosphorus estimate modeled by NRC (2012) is adequate to maximize feed efficiency, but underestimates the requirement to maximize growth and economic performance.